A local landscaper gives tips on how to protect your home before the next storm hits. Austin Carter reports. Whenever it rains in Las Vegas, the reports begin pouring in of downed trees falling into homes and even cars. 13 Action News talked to a local landscaper has a few tips on how to protect your property. 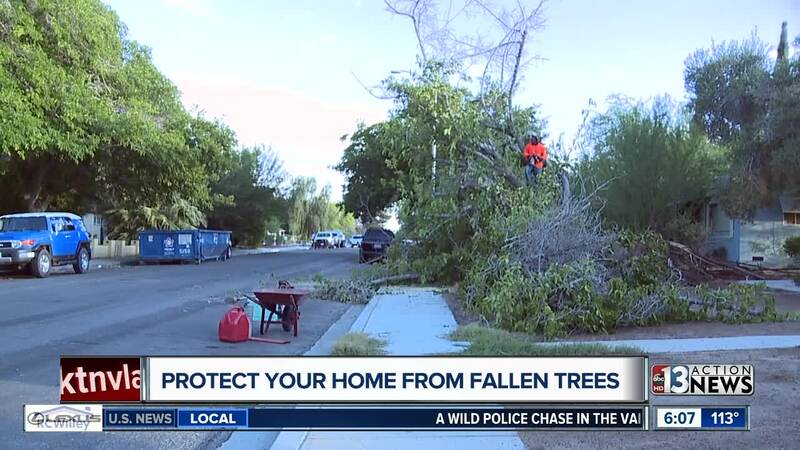 Kevin Harlow of Sierra Landscape and Maintenance says during the summer, he gets phone calls that trees have blown over in the wind or have landed on homes. Kevin says the root cause is usually poorly rooted trees that become oversaturated in a quick moving monsoon storm, and can no longer hold themselves up. “You could have two trees right next to each other and one could take out the other, and now you’ve got two problems on top of that," says Harlow. Harlow says to take a look at the placement of trees in your front and back yards, and eyeball how close they are to your driveway, house and also your neighbor’s home. “Are they leaning, are they heavy on one side, does the tree have a large canopy that is really really dense." Harlow's biggest piece of advice if you do notice a tree that is leaning and fear it will topple over, to call a maintenance provider or landscaper. Those crews can go in and safely cut the tree out of the ground ahead of time.